My aim is to make tools I can use. I generally take my inspiration from some of the magnificent tools made in the mid to late 1800's, when decoration on a tool was there for it own sake, and perhaps to inspire the user. Steel, brass and exotic woods combine to make beautiful tools that are a pleasure to use in my workshop, and hopefully an heirloom for my family to have and to use for many generations. 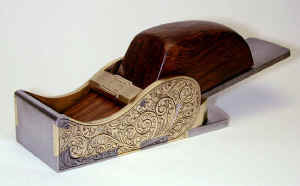 Dovetailed steel and brass chariot plane with a Walnut wedge - by Peter McBride. Engraved sides by Nick Karagulidis - Melbourne, Australia. The next plane was the Skew mouth Chariot, a plane I wanted to use on tenon cheeks. Once I started it, I quickly found it was a very difficult plane to get everything in the right place at the right angle. The bullnose chariot, left, was the first dovetailed plane I made. It's something I had wanted to make for many years. I thought it would be a fun project, but wasn't prepared for the additional level of pleasure to be had by using the plane on woodwork projects. Most plane makers don't fabricate using brass, steel and silver solder, but I thought it might suite this next plane I made. 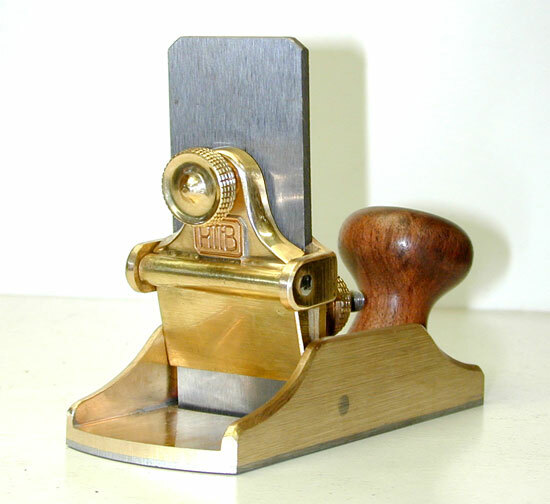 A copy of the Stanley # 212 small scraper plane. This plane has a steel base lead soldered onto the bottom, done in the same way as the restoration of these planes below, a smoother and two rebate planes. 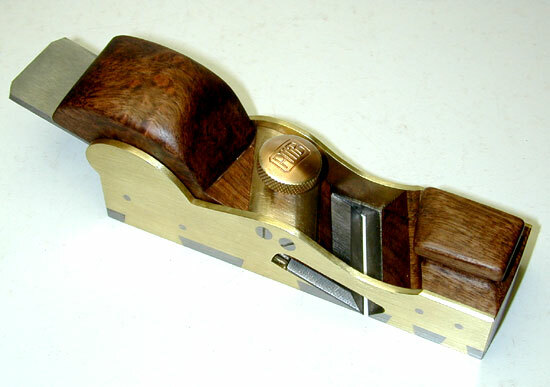 The soldering of the bases to the planes, and restoration process can be seen here.